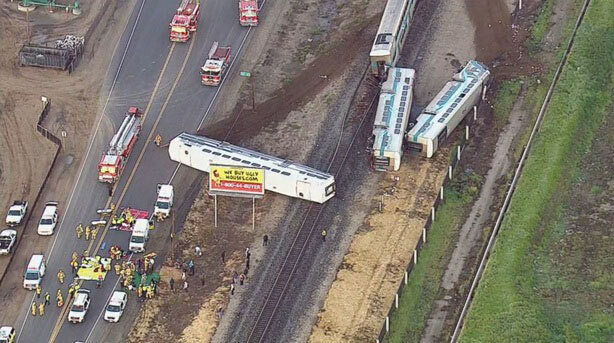 A produce truck driver from Arizona is in custody and cooperating with authorities after fleeing the scene of where his truck was struck by a Metrolink train near Oxnard, California early this morning. According to Oxnard Assistant Police Chief Jason Benites, the produce truck appeared to have been traveling southbound and attempted to make a right turn onto a street, but instead turned onto the railroad tracks and got stuck. While it’s still unclear as to whether the area was part of the driver’s regular route, the Metrolink train had left the Oxnard station on its regular early morning commute to Los Angeles. With two miles of straight tracks, the train engineer was at least able to spot the vehicle on the tracks early enough to start pulling the brakes and give off warning signals. Although the train had also been going slower than it’s 79 mph cruising speed, it was unable to slow down in time to avoid the crash. At about 5:40am the Ventura County Line Train 102 struck the small tractor-trailer and the truck immediately ignited into flames. The impact also caused five of the train’s cars to derail with three of them flipping right on their sides. Fortunately there were no fatalities, but of the 49 people on the train, including three crewmembers and 46 passengers, 28 people were taken to hospitals with injuries and four were in critical condition, including the train engineer. Passengers recall feeling a sudden jerk before they were lifted into the air. "It just seemed like slow motion. It seemed like it took forever," said passenger Joel Bingham. Witnesses were in disbelief as they watched the produce truck erupt into flames and the train’s passenger cars get thrown from the tracks in impossible directions. After everything came to a stop, Bingham says that he opened a safety window and called for his fellow passengers to follow his voice in the darkness so they could get out. "I just went into rescue mode. I could smell smoke and fire," Bingham said. It’s still uncertain as to when the driver managed to flee the scene, but an officer spotted a man walking along the street about a mile south of the crash and determined that he was the truck driver. "It appeared that he was very distressed. The person appeared to be disoriented and on the phone," said Benites. The truck driver was not injured, but was taken to a hospital for observation and then later taken into custody. He has been cooperating since and there is still no word as to whether he will be facing any charges. Metrolink spokesman Jeff Lustgarten said that crash safety technology certainly worked to soften the blow of the collision. "We can safely say the technology worked. It definitely minimized the impact. It would have been much worse without it," said Lustgarten. The National Transportation Safety Board has sent a team to investigate the crash and determine all the factors that contributed to this accident. Has anyone read that it says Pick up pulling a trailer not a tractor trailer? CK drivers, and then those that want to BE. Love ya BUD. I may not have been an American driving that rig. Well thats gonna be expensive. Run.......till your legs will carry you no more! Shoot! ....he R U N N O F T ! Too many oyes with photo copied DLs out there nowadays.